“There’s nothing romantic about the war years or being poor’” Mother says flatly. “A diet of too many foreign books by authors who have not lived through the war. That’s what you get with an English education!” with that she walks off into the kitchen. What is Cucina Povera? A rough working definition would be the style of cooking best represented by the lower working class of any given society. It's about making great tasting food with simple, easily available ingredients that is shunned by the moneyed. Innards, pig’s ears, tails, heads, fat, etc. Back to basics, nostalgic reminisces that leaves us with a fuzzy glow: Grand mamma’s Lard Rice. Comparatively, only plain white rice is simpler than this pauper's dish. When we were little and oft time “a complaining-hungry, wretched lot” we would stop in a middle of a game and troop into the sweltering heat of the kitchen to make a nuisances of ourselves. Whinging. Whining. The rice would have been cooked by then. Grand mamma furrows her brow slightly as she turns to look at us. She would shake her head sometimes. Watches the fire, waits a while and then opens the rice pot just as it was drying out. She stirs the rice with her big wooden ladle and scoops up several ladles full into her chipped white enamel bowl. The one with that blue trim. Hot steam rises from the bowl. She sets that aside on the red brick stove. She uncovers and takes a small steel ladle from her blue enamel pot of lard oil with crackling mixes a scoop of the oil and a dollop of thick caramelised black soy sauce with the rice. She cracks a raw egg with a few dash of white pepper and mixes this in thoroughly. A sprinkling of chop spring onion. And Voilà. We relish that smell, that buttery taste. It is the ultimate comfort food that is heart and soul warming. And it definitely hits the spot. 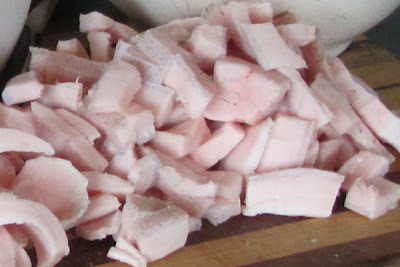 Lard rendered by frying the white pinkish cubes of pig fat until oil oozes out. The shrivelled bits left behind are called crackling. It is commonly used in Chinese cooking in Malaysia until it was replaced by coconut oil and ultimately palm oil.